Within the poverty and violence of Cité Soleil, a courageous group of young men draw a line in the sand and say, “Here we make a stand for the children who are the future of Haiti and the future of the world.” Four days [and often more] every week, these heroes work with over 100 young boys and girls to strengthen hearts, minds, and bodies. These valiant men are boxers and they teach the children life lessons by training them in the art of pugilism. Boxing demands discipline, and it teaches the children to focus, an essential skill in a world characterized by chaos. 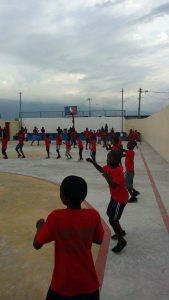 A year ago, we were able to raise $5,000 to send 20 children who participate in the Guepard Boxing Club of Cité Soleil (GBCCS) to school. We have been monitoring progress and performance throughout the school year. I receive copies of report cards directly from the principal of the school, Juan Pablo Roberto Baptistao (Touta) and I maintain regular contact with him and the GBCCS coaches and managers. 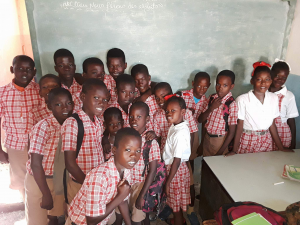 We are midway through the fourth semester of this school year, and we are committed to funding these same 20 children, and more for the next school year, 2018 – 2019. Raising funds is a challenge. In upcoming weeks, we will share more information about our work with Guepard Boxing Club and the children we support in school. Our good friends Dwight and Letty Cox have already initiated the 2018/19 education fund with a $1,000 donation. Please consider joining them with whatever help you can offer. Use the donate button to send a donation to Gail’s Nicole Megaloudis Foundation and note that it is for the Guepard education fund. Please use the contact form below to ask questions or request additional information. 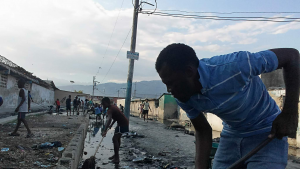 Again, we will be sharing more news from Team Guepard and how it promotes education and learning in Haiti. Please consider using the ‘share buttons’ at the end of the post to share our quest for a better world with your friends, families, and associates.